The peninsula was originally known as La Punta de California (the Point of California) until the first land expedition renamed it "La Loma de San Diego" in 1769. In 1782, "La Punta de la Loma" was recorded on a map, and eventually the lengthy name was shortened to Point Loma. In 1852, the Fort at Ballast Point was built on the peninsula and renamed Fort Rosecrans in 1899, after Civil War Gen. William S. Rosecrans. Today, the military still maintains a presence in Point Loma, including SPAWAR, a submarine base, and naval and Coast Guard rescue facilities. Point Loma is has several distinct residential neighborhoods and a well-developed commercial core. The community also includes Point Loma Nazarene College and three major regional recreational resources: Sunset Cliffs, Shelter Island and Cabrillo National Monument. Point Loma has an estimated population of 38,000, not including Ocean Beach, according to the 2010 U.S. Census. Next Level Sailing offers weekend sailors a chance to crew an America's Cup yacht for the day. Liberty Station, currently under construction on the former Naval Training Center, will include 350,000 square feet of space dedicated to the arts and cultural activities. The American Ecotourism Association (AEA) defines Ecotourism as pleasure travel to nature and culture based areas which minimizes ecological impact and supports the well-being of the community. In practice, ecotourists visit and interact with a natural or a cultural environment, and the local community benefits from their tourist dollars. 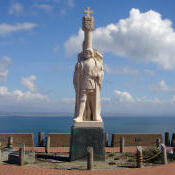 Point Loma is a 7-mile strip of land that serves as a gateway to San Diego Bay. The community has a strong tradition of the sea, long ties to the U.S. Navy and a bustling tourist industry. Residents and visitors alike participate in activities such as surfing, sailing, diving, tide pooling and beachcombing, or simply relaxing at Point Loma beaches and shores. The Point Loma Lighthouse and Cabrillo National Monument are popular attractions. The exclusive neighborhood boasts well-manicured and eclectic homes, many with views of the ocean or San Diego Harbor. Point Loma's rich history, many beaches, tide pools, ocean views, marinas and yacht clubs offer natural beauty and make it one of the most visited spots in San Diego.